On the Continent a popular cycling event is the "Grand Prix de Gentlemen". In this a vet and a younger cyclist are paired together and they time trial over various distances. Similar races were promoted by the vets in Dublin back in the 70's and 80's. 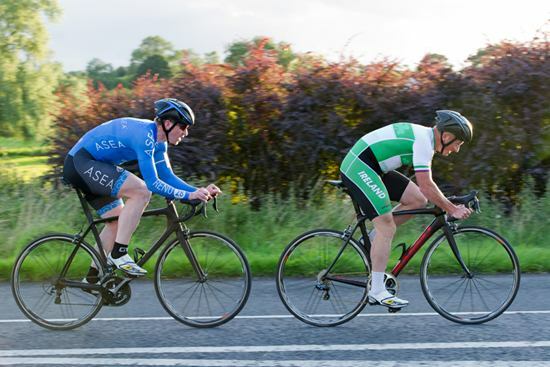 Last Thursday, Square Wheels CC, sponsored by Rushmere, organised a similar competition over 10 miles on Armagh's Moy Road. Only this time different couplings were permitted: male/male, male/female and female/female. Thirty nine teams took to the start from 17 different clubs with riders from as far as Navan and Ballymoney. But the main attraction for most was Damian Shaw, current Irish Road Champion partnered by Irish Road Series Champion Bryan McCrystal. Sure enough these two took one of the first prizes: fastest on conventional road bikes, with a time of 20mins:14.6. But Shaw and McCrystal didn't get all things their own way. Emyvale pair Patrick McKenna and Martin Sherry pipped them for fastest overall. At 19.59 they set a new course record and also surprised the organisers by taking the special prize for sub-20 mins. The time of 19.59 represents an overall speed of 49kph. This compares well with many Tour de France stages! One question immediately springs to mind: how would the results have changed had the two Irish Champions been on specialist time trial bikes? Another highlight was Square Wheels own Emmet Vallely coming third along with Richard Timmins from Orchard/Shellbourne, with a time of 20.46.4. Also from SQW, Fancea McNally and Mary McConville took 1st in the female/female competition. In the mixed competition a superb performance from Ballymena's Eileen and Jason Burns who broke 21 mins. Many thanks to Martin Walsh and Rushmere for the fantastic support. Also Joe Henry from Velo Café Magasin, Dave Smith from Velocity and Vitality and Conal Hamill for the generous spot prizes. Thanks also to catering team, to the PSNI, to the ambulance services and all the marshals.